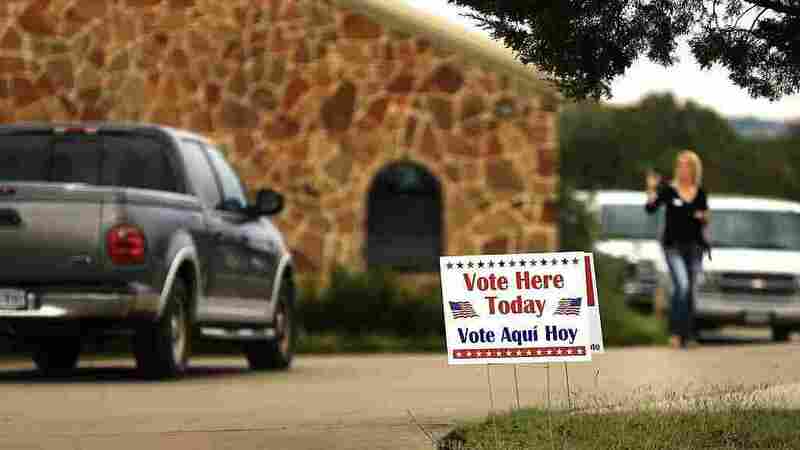 Justice Department Reverses Position On Texas Voter ID Law Case The Trump Justice Department asked a federal court to dismiss the Obama DOJ's earlier claim that the ID law was enacted with the intention of discriminating against minority voters. Voters arrive at a polling place November 8, 2016 in Brock, Texas. The Department of Justice is reversing the federal government's position in an important voting rights case, involving a Texas voter ID law. The switch was not unexpected following the election of Donald Trump and confirmation of Jeff Sessions as Attorney General. Both Trump and Sessions claim voter fraud is a major problem and have backed voter ID laws. In a motion filed Monday, DOJ asked a federal court to dismiss the department's earlier claim that the ID law was enacted with the intention of discriminating against minority voters. That claim was made by the Obama administration as part of a broader legal challenge to the law, which is among the strictest in the nation. But the Trump administration notes that the Texas legislature is now considering changing the law to address concerns that it hurts minorities. DOJ says those efforts should be allowed to proceed. Voting rights advocates, who worked with the Obama Justice Department for years on the court challenge, expressed outrage at the reversal. In a written statement, Gerry Hebert of the Campaign Legal Center, which represents some of the plaintiffs, said, "I am appalled and disgusted that DOJ would abandon their claims, that they have advocated for the last six years, that TX's photo ID law was enacted with a racially discriminatory purpose." He and others have argued that hundreds of thousands of legitimate voters in the state lack the required ID, such as a driver's license or gun permit, and that many of them would have a difficult time acquiring one. They also claim that the state legislature passed the law with the intention of discriminating against minority voters, primarily Hispanics, who are less likely to have the required ID. A federal appeals court last year agreed that the law had a discriminatory impact, but asked the lower court to reconsider its findings that the law was passed with a discriminatory intent. The DOJ's move comes amid continued partisan debate over the need for tough new ID requirements, and the impact such laws have on minority voters. Republicans say voter ID laws are needed to prevent voter fraud, but Democrats argue the laws are intended to block legitimate voters who tend to favor Democrats. The Justice Department under the Obama administration actively challenged such laws in Texas and several other states. The new administration sent signals almost immediately that it might switch sides. DOJ filed a motion Jan. 20 — Inauguration Day — requesting that a hearing on the case be delayed until Feb. 28th to give the new administration time to assess its position. That motion was granted. Then last week, the Justice Department joined Texas Attorney General Ken Paxton in asking the court to delay the case until June to allow the state legislature to revise the law. Legislators are considering a proposal to allow those without a required photo ID to vote if they sign an affidavit declaring that they face a reasonable impediment to getting one. The measure also includes strict penalties for those who falsely make that claim. However, the judge denied that request and the hearing on whether the law was passed with discriminatory intent is still scheduled for Tuesday in federal district court in Corpus Christi. Voting rights groups say they'll continue to pursue the case, even without DOJ support. The switch in the government's position comes amid unverified — and widely discredited — claims by Trump that millions of people voted illegally in November. He has asked Vice President Mike Pence to lead an investigation into those claims. Voting rights activists are worried that the new administration and state legislatures under Republican control will use the inquiry to justify more voting restrictions.